Kalvin Phillips has undoubtedly emerged as a crucial player for Marcelo Bielsa this season as he has played in the deepest role in midfield to perfection. The English midfielder has gone from strength to strength this season and is one of the first names on the teamsheet. However, his impressive form and performance haven’t gone unnoticed, and Southampton are said to be readying a bid worth £20m for the midfielder. Now that’s a lot of money for a player who is yet to play in the Premier League, and the Whites could be tempted to sell. We believe their first preference would be to keep hold of the player. However, in a scenario of if the Whites go on to sell him, we look at three plausible options they can go after in the summer. The Whites have already been linked with this Uruguayan international, and this little dynamite in midfield can be a real handful for Bielsa. We feel that he will be an upgrade over Phillips and the club should go after him if they go on to sell their English midfielder. Nandez can play in a box to box role as well as a defensive midfielder, and the Boca Juniors player has impressive work rate. He isn’t shy about going into challenges, and he is a perfect midfield disruptor. To go with all that, the 23-year-old has decent on the ball qualities as well, and he would be an ideal player for Leeds United. The former Chelsea midfielder hasn’t been able to establish himself under Javi Gracia for Watford. The midfielder has managed seven appearances in the Premier League this season, and that could be the reason why he could look to move away from Vicarage Road in the summer. Chalobah is a midfield powerhouse who can be a reliable option for the Whites. He is versatile, athletic and showcases impressive work rate which are the primary ingredients Bielsa looks for in his midfielder. The 24-year-old managed a cap for the England national team in 2018. The Leicester city midfielder is a midfield beast who can play as a centre back and right back when required. Amartey has struggled for game time at the King Power Stadium as the Foxes have a top defensive midfielder in the form of Wilfred Ndidi. Given Amartey’s pace, tackling abilities and work rate, we feel that he could seamlessly fit in Bielsa’s system in the deepest role in midfield. Ligue 1 Winger Set To Leave This Summer Amid Interest From Arsenal: Huge Boost For The Gunners? Stoke City And Swansea City Among Those Interested In Leicester City Ace: Rash Decision By Puel? Leicester City Midfielder Sought By West Brom Amongst Others: Should Puel Agree To Let Him Leave? 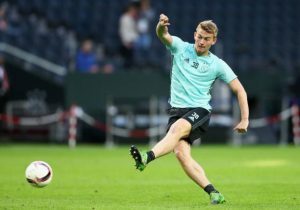 Stoke City Interested In Signing 23 Y/O Midfield Ace From Leicester City: Right Man For Rowett’s Plans? West Brom Join Race To Sign 23 Y/O Leicester City Midfielder: What Can He Add To Moore’s Side?